Around the world, a growing shortage of nurses in hospitals and clinics is leading to concern about the quality of care patients can expect to recieve. Hoping to improve the situation, a new telemedicine device from start-up Sense.ly could help to ensure that patients continue to receive the care they need, despite limited human resources. 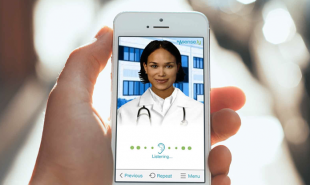 Sense.ly’s virtual nurse — named Molly — is an avatar who provides quality care to patients in between appointments. The service is available to patients who suffer from common, chronic, medical conditions such as heart failure or diabetes. To begin, patients sign up to Sense.ly at home or through their clinician. The platform then creates a personalized care plan, based on the patient’s medical records and individual needs. The patient can follow the prescribed regimen from home, checking in with the nurse avatar periodically through their computer or smartphone. Clinicians can access their patient’s information any time by simply logging into the platform. Sense.ly automatically alerts medical carers if the patient develops worrying symptoms. Molly has a friendly face, a softly spoken voice and a pleasant demeanor, enabling patients to receive the bedside manner they expect. She interacts with the patient using speech recognition technology, asking simple questions which require a spoken or tapped response, guiding patients through daily exercises and collecting real-time medical data which can then be analyzed by clinicians. The platform also enables patients to communicate directly with their doctor or schedule in person appointments. Are there other medical avatars which could help healthcare workers lighten their load?